clients, new & ongoing. Our team together accomplishes this by feeling truly fortunate having the capability of working within an industry to share our creative talents not just as colleges but a family of friends. 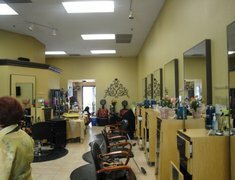 We are not a competitive salon, rather guide our clients accordingly to accomplish the "LOOK" desired. Every stylist at Studio MG Salon is well trained and experienced, all professionals at our salon come with many talents, nonetheless, we acknowledge each-others strengths & make it our personal mission to guide every client to receive the best service.